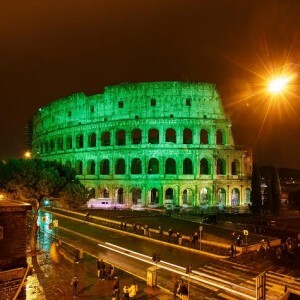 Tourism Ireland has announced that the Colosseum in Rome, the Leaning Tower of Pisa, the Sacré-Cœur Basilica in Paris, the Christ the Redeemer statue in Rio de Janeiro and Nelson’s Column in London will go green this year to celebrate St Patrick’s Day, as part of the organisation’s seventh annual Global Greening initiative. New ‘greenings’ for 2016 will include 7 World Trade Center at Ground Zero in New York, the famous Big Wheel onPlace de la Concorde in Paris, Mole Antonelliana in Turin (the architectural symbol of the city), the light rail system in Addis Ababa (the first light rail system in sub-Saharan Africa) and City Hall in Tel Aviv. Also, the famous Boston Red Sox (baseball team) will wear green jerseys on St Patrick’s Day, for their spring training game in Florida. And their home ground, Fenway Park in Boston, will also join in the ‘greening’ fun – with the inside of the ballpark, the scoreboards and the ‘Green Monster’ (high left field wall) all set to be illuminated in green. Tourism Ireland’s unique global campaign – which sees some of the world’s most famous attractions and sites goinggreen to mark St Patrick’s Day – kicks off the organisation’s €21.5 first half promotional drive to grow overseas tourism in 2016. The Global Greening initiative has truly gone from strength to strength, with a number of new sites signing up to take part in 2016. These include the Bridgestone Arena in Nashville (home of the Nashville Predators ice hockey team),Mount Ulriken TV mast in Bergen, Porte Dijeaux in Bordeaux, Monza’s Villa Reale in Italy and the Hofbräuhaus in Munich. In Brazil, five sites will be illuminated in green for the first time ever on St Patrick’s Day – including the Amazon Theatre (opera house in the heart of the Amazon Rainforest), the Elevador Lacerda in Salvador (an historic art deco elevator which connects the upper and lower parts of the city) and the Carioca Aqueduct in Rio de Janeiro. The new sites will join some ‘old favourites’ which have gone green in previous years – including the Colosseum in Rome, the ‘Welcome’ sign in Las Vegas, the Allianz Arena in Munich, the Empire State Building in New York and the Sky Tower in Auckland.